Us kids and dogs on the east coast have some wild weather coming up, and as scary as it can be for us, it can be even more scary for your dog. 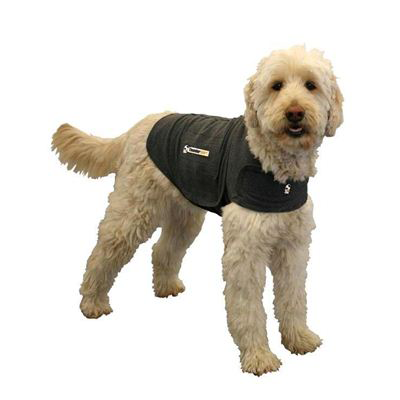 There is a simple, comfortable solution that takes the terror out of thunder, lightening, fireworks, hundreds of cheering wedding ceremony guests, and other scary noisy things; it’s called the Thundershirt. It’s a cozy little coat that acts like a big hug, with constant gentle pressure that has been proven to reduce anxiety in over 80% of the dogs who’ve worn it. (They also make a version for cats.) It comes in several different colors (including a heather gray that goes with just about any color of dogl….) and it can be embroidered with your dog’s name. At 39.99, (with free shipping!) it’s a simple, inexpensive solution for all those scary times that send Sophie under the bed, shaking and unhappy. And, as an extra bonus, they’ve partnered with Petfinder to make Thundershirts available to thousands of pets in shelters across the country. It’s all good! Previous Paws for a Cause Next Here Comes the Dog!